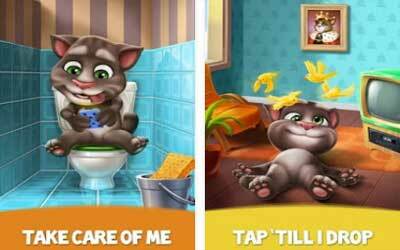 Previous version My Talking Tom 3.6.0.19 apk for Android will help you to downgrade or install older app easily. This is one of the best Casual apps. If people are pretty familiar with Talking Tom Cat as well as Talking Tom Cat 2, they will find similarity of those games with My Talking Tom. The playing rule of the game is pretty simple because people only need to keep the cat happy by doing various simple things including feeding, petting, taking to the bathroom, putting to sleep, and of course playing games with the cat. Basic functions of the Talking Tom Cat app can still be found in this game. However, players will be able to do much more with the cat. They will have more role as the cat owner. The cat still repeats the word which is said by users with the high pitched voice. It will also show different reaction when the players touch it in different ways. However, people can feel more of the virtual pet game taste because they can do more with the cute friend including playing mini-games. The appearance of the cat can also be customized. The players can also choose food which can be suitable with the cat. More importantly, players will also be able to decorate the house of the cat according to their preference. NEW MINI GAME: Catapult your Tom to new heights. FOOD MARKET MAKEOVER: Food shopping for top tomcat has never been this realistic! Go and grab something delicious! My kids love this game, and I catch myself playing it as well. Easy to manage and fun to.